The day Deborah Katz dreamed about all summer took place on Friday. Tucked away in various rooms at the rear of Scarlett Middle School were professional musicians – all working with band students who were spending the day immersed in music. 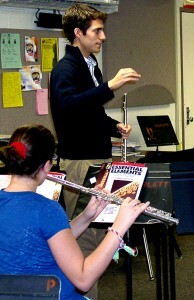 A flute clinic was one of 10 to take place at Scarlett Middle School during Band Clinic Day on Oct. 8. The day was coordinated by teacher Deborah Katz and funded through a grant from the E. Daniel Long Fund for Excellence in Music Education. It was the first Scarlett Middle School Band Clinic Day, funded through $1,000 from the E. Daniel Long Fund for Excellence in Music Education, plus donations for lunch from the school’s PTSO and Hiller’s Markets. Katz, the school’s band teacher, earned the fund’s first award last spring; it is named after retired Ann Arbor music teacher Dan Long. Long and his wife, Kay, also a retired Ann Arbor music teacher, visited Scarlett for the first clinic and said it is the type of activity he envisioned when the fund was set up eight years ago. Many music teachers and supporters from around the county have contributed to the fund in Long’s name. Katz said she wanted to bring the 10 professionals to Scarlett to give her students the experience of a private music lesson – because many of her students don’t get that opportunity. “These students are in an environment where the teachers can take the time to go over the technical things you can’t do when there are 60 kids waiting,” she said. Some of the instruction was one-on-one at Scarlett's Band Clinic Day. Both Eastern Michigan University and The University of Michigan were represented at the clinic as well as a number of private music teachers from the area. The grant paid for a stipend allowing the teachers to come for the day. Students experienced full group clinics as well as time to meet and interact with the teachers one-on-one. The experts did clinics on flute, oboe, bassoon, clarinet, saxophone, trumpet, French horn, trombone, baritone/tuba and percussion instruments. Between 120 and 130 students are involved in the Scarlett band program and Katz said she would like to “grow the program and raise the bar at the same time.” She has been the band director there for three years. In Ann Arbor, every fifth-grader plays a instrument, which helps stimulate interest in music and the band program in middle and high schools. Not only does Katz work with her middle school students, but she also visits Scarlett’s feeder elementary schools to encourage fifth-graders to participate in band when they arrive in middle school. Katz said she would like to see the clinic day continue either once or twice each year for Scarlett music students. She said if any local group or business is interested in sponsoring it, she would name the day in their honor. She can be reached by e-mailing katz@aaps.k12.mi.us. About the award: The E. Daniel Long Fund for Excellence in Music Education is named for longtime Ann Arbor music teacher Dan Long, who still lives in Ann Arbor with his wife, Kay. It is administered by the Ann Arbor Area Community Foundation and can be given to any music educator in Washtenaw County. The first award was given in 2010. For information about the award or to make a donation, visit www.aaacf.org or call 734-663-0401.